Camas flowers are a beautiful native wild flower in the Pacific Northwest. Once used by the native peoples as a staple food, the flowers are now enjoyed as a welcome harbinger of summer. This shawl evokes the ethereal and fleeting beauty of the camas flower. The nupps evoke the open flowers and stalks that rise from the bulb. The twisted stitch ground between the flowers represents the other woodland and priarie plants that may be found near fields of camas. I chose a lovely blue for my shawl, though not the blue of true camas flowers. 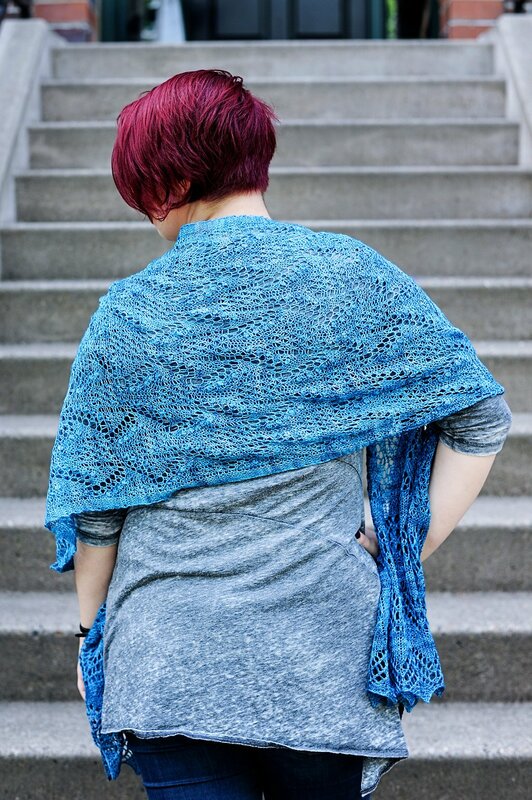 However, this shawl would look equally lovely in any other color. This pattern is meant for intermediate knitters to experienced knitters and all those in-between. Please read the entire pattern before beginning. To alter the size: Adjust your gauge to increase or decrease the width of the shawl as needed; add or subtract repeats of the chart to adjust the length.